Ready for the trick or treaters this weekend? If you need to stock up on goodies to give out to all those little ghosts and ghoulies then this new offer at Morrisons is the best one around right now. They are offering selected multipack chocolates and sweets at 2 packs for £3, and that can work out as little as 7p per bag! The best value is the Treat Size Cadbury Heroes* which has 20 different chocolate miniatures like Buttons, Crunchies, Fudge, Flakes and Twirls so two packs of those would work out at 7.5p per bar or bag and that's great value for Cadbury's. Even cheaper per item is the Maynards Discovery Patch Animals multipacks as they works out at just over 7p per bag on this offer! 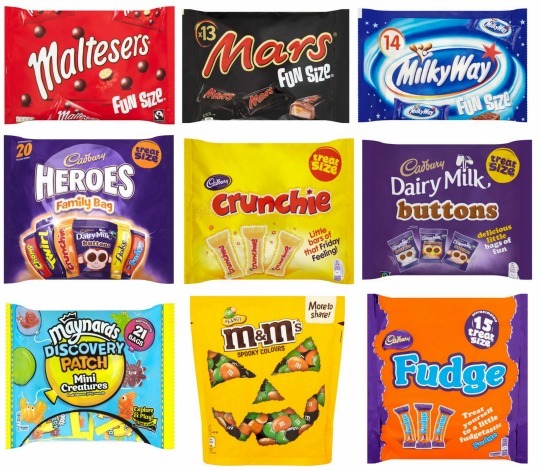 Also in this 2 for £3 multipacks offer are Maltesers, Dairy Milk Buttons, Fun Size Mars, Crunchies, Fudge Treatsize, Milky Way Funsize, and even the big 300g sharing pouches of Halloween themed Peanut M&Ms (though I wouldn't be sharing those with the trick or treaters! ).